The new 2016 BMW 7 Series makes its world debut today. The brand’s flagship is in its sixth generation and aims to set a new benchmark in the segment with its lightweight design, driving dynamics, comfort and luxury features, intelligent connectivity and extensive cabin tech. The all-new BMW 7 Series will be introduced in the US as a 740i and a 750i xDrive model; the company has yet to say if other models will follow. The European market will also get at launch time the 730d and 730Ld models, both with a rear-wheel drive setup or all-wheel drive. A plug-in hybrid 740Le is also part of the official press release. BMW’s flagship features new technologies such as Gesture Control, Wireless Charging, the standalone option of the Display Key, Panorama glass roof Sky Lounge, Bowers & Wilkins Diamond surround sound system, anti-dazzle BMW Laserlight with BMW Selective Beam, Driving Assistant, among many others. An Active Kidney Grille will also be available for the first time in the US. BMW has gone to great lengths to insure that its newest 7 Series is as advanced, in terms of both luxury and technology, as possible. 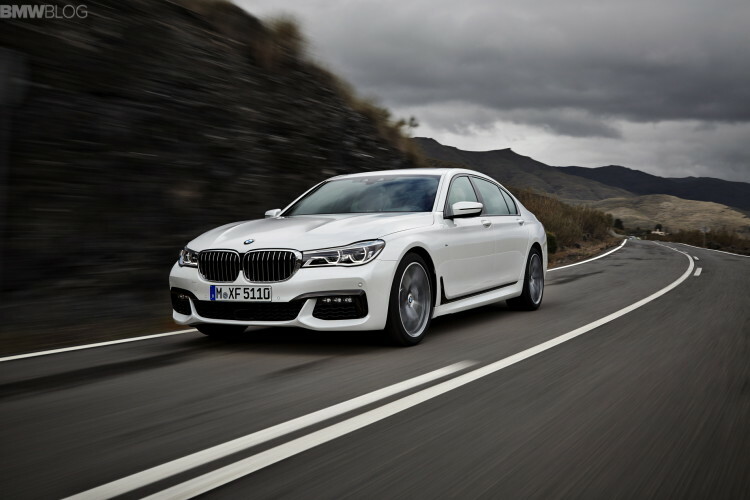 The 2016 7 Series has undergone a massive weight reduction, with BMW utilizing high-end materials, such as aluminum, magnesium and CFRP, as much as possible. The savings are up to 130 kg (286 lbs). The whole car looks tighter and crisper. The large kidney grilles are front and center and display an air of power and opulence as the full LED headlights seem to flow out of them. The hood is also lower and leaner, giving the new 7er a more aggressive and sporting look. Where the old one looked rather large and bloated, this new 7er’s rear end looks slimmer with a nice silhouette. It’s much tighter and leaner than before and its full LED taillights have been slimmed down. With a lovely array of leather, wood and aluminum, the new 7 Series’ interior has a bright, comfortable and airy feel to it. There’s a new iDrive system, version 5.0, which utilizes touchscreen inputs as well as Gesture Control. The gauge cluster has been replaced with a 12.3” screen, displaying different gauges while in different Driving Modes. There is also an all-new graphic Head-Up Display, which can display road speed, turn-by-turn navigation. Everything within arms reach is covered in either leather, beautifully finished wood or aluminum. The rear seats get a wide array of climate and seating controls via a touchscreen display built into the armrest. Overall, the entire car isn’t a design revolution, but it’s a great evolution over the previous design and one that will hold its own with the S-Class from Stuttgart. 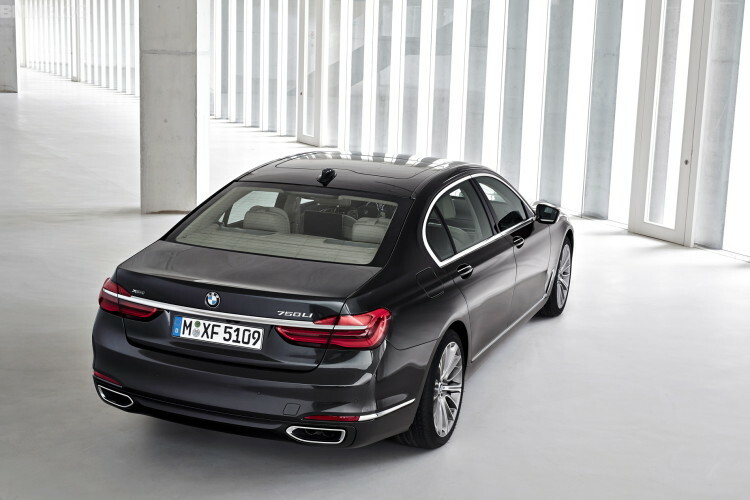 The 2016 BMW 7 Series will arrive in the US showrooms in the fall of 2015. The MSRP for the BMW 740i will be $81,300 and the BMW 750i xDrive will be $97,400 (prices do not include Destination and Handling). Check out the full press release below and the extensive photo gallery. Today, BMW unveiled the all-new BMW 7 Series, the brand’s flagship in its sixth generation. The 2016 BMW 7 Series sets a new benchmark in lightweight design, driving dynamics, comfort, intelligent connectivity and intuitive operation. The extensive use of carbon-fiber- reinforced plastic (CFRP) in the structure of the passenger cell and the strategic application of lightweight design reduce weight and increase both the overall torsion strength and bending stiffness of the passenger cell. 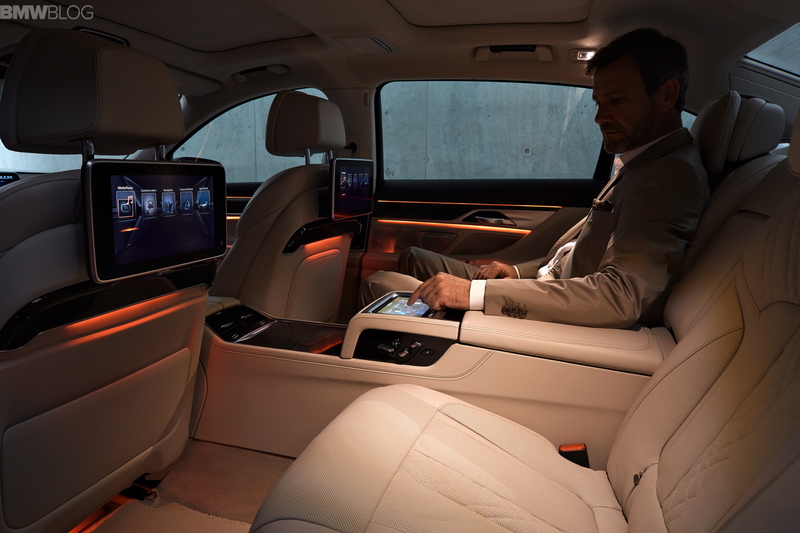 The all-new BMW 7 Series will be introduced in the US as a 740i and a 750i xDrive model featuring BMWs newest and groundbreaking technologies such as Gesture Control, Wireless Charging and the standalone option of the Display Key. An Active Kidney Grille will also be available for the first time in the US. The all- new BMW 7 Series once again sets the standard for luxury performance, delivering the highest level of driving refinement in the premium class. 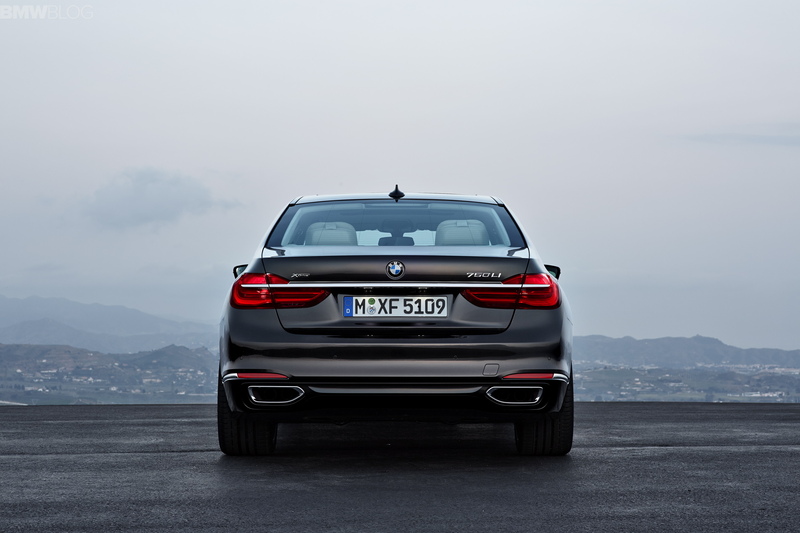 The 2016 BMW 7 Series will arrive in the US showrooms in the fall of 2015. The MSRP for the BMW 740i will be $81,300 and the BMW 750i xDrive will be $97,400 (prices do not include Destination and Handling). BMW’s flagship vehicle reflects the company’s dedication to pioneer with the development of groundbreaking technology while upholding the 7 Series precedent of comfort and driving dynamics. 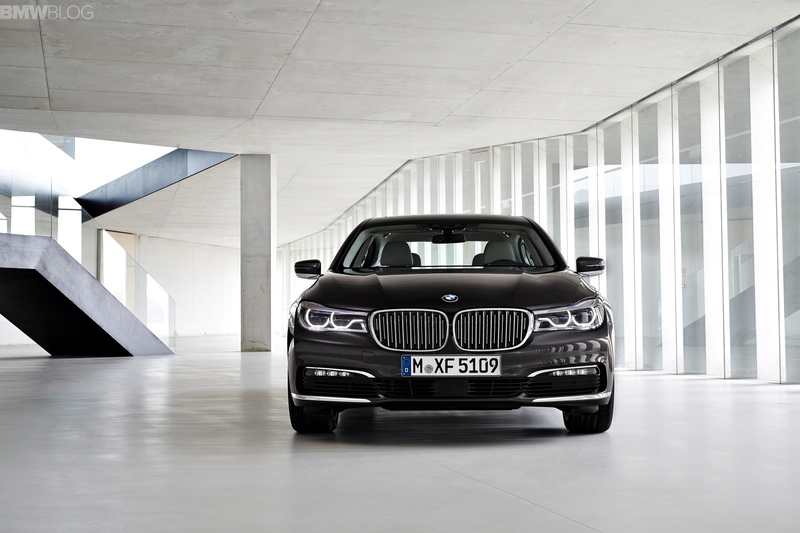 First introduced to the U.S. market in 1978, the new BMW 7 Series will be in its sixth generation. Many features and technologies developed by BMW, introduced in previous generations of the 7 Series, set the precedent for the future. Pace-Setting Technologies such as Antilock Braking System (ABS) first appeared in the 1978 model which also was the world’s first production car to feature an electronic engine management computer (Digital Motor Electronics – DME). Illustrating segment leadership, an on-board computer (OBC) and Electronic Cruise Control set the standard for luxurious long-distance travel. The second generation, incorporated groundbreaking technologies such as Automatic Stability Control, adaptive transmission control, anti-tapping windows with express up and down on all four door windows and moonroof in addition to the world’s first use of integrated body electronics with advanced diagnostic capabilities and Xenon Headlights (750iL). Technologies such as Dynamic Stability Control, Head Protection System and on-board Navigation System with moving map, CAN Bus technology for body electronics (5 integrated control units) and the revolutionary side-impact Interlocking Door Anchoring System defined the third generation. For the first time in the US the V8 featured VALVETRONIC variable valve lift technology. In its fourth generation, BMW introduced Active Roll Stabilization (ARS) on a sedan, MOST Bus technology for body electrical with 70+ control units on common busses and infinitely variable intake manifold. For the first time, the world also benefitted from adaptive brake lights and electromechanical parking brake and electronic adaptive headlights. BMW continued with the introduction of pace- setting technologies in its fifth generation 7 Series which hit the U.S. market in 2009. Night Vision 2 with Pedestrian Detection, Integral Active Steering, Adaptive Headlights with Dynamic Headlamp Control system with sensors measuring speed, steering angle and yaw as well as “reverse flow” cylinder heads to facilitate better packaging and minimize turbo lag defined this generation. The BMW core principle of safe transportation was assured with features such as Blind Spot Detection and Lane Departure Warning system. 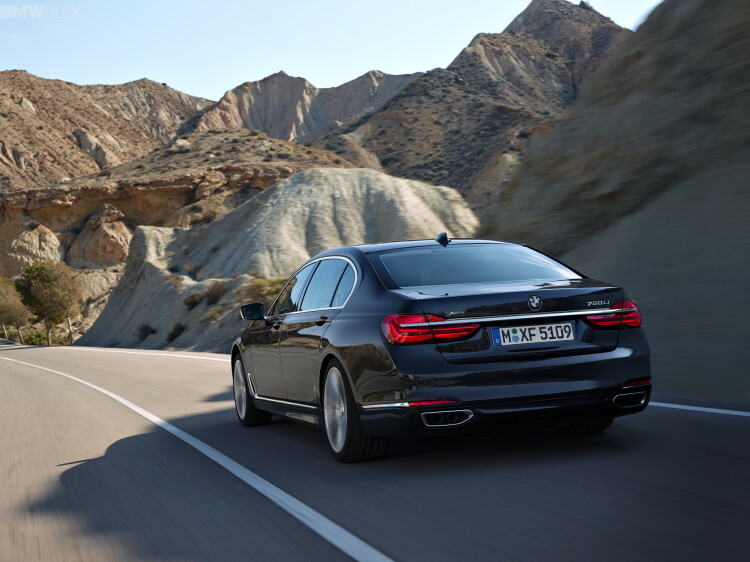 Active Cruise Control with frontal Collision Warning System, Dynamic Damping Control and Driving Dynamic Control assured the 7 Series reputation of safe and efficient long-distance comfort. The M Sport package enables customers to experience the dynamic driving properties of the new BMW 7 Series in greater depth. This package includes an M Aerodynamic kit comprising model-specific front/rear aprons and side skirts, plus 19 inch or 20 inch M light- alloy wheels, illuminated door sill plates bearing the M logo and accents in either light or dark chrome. 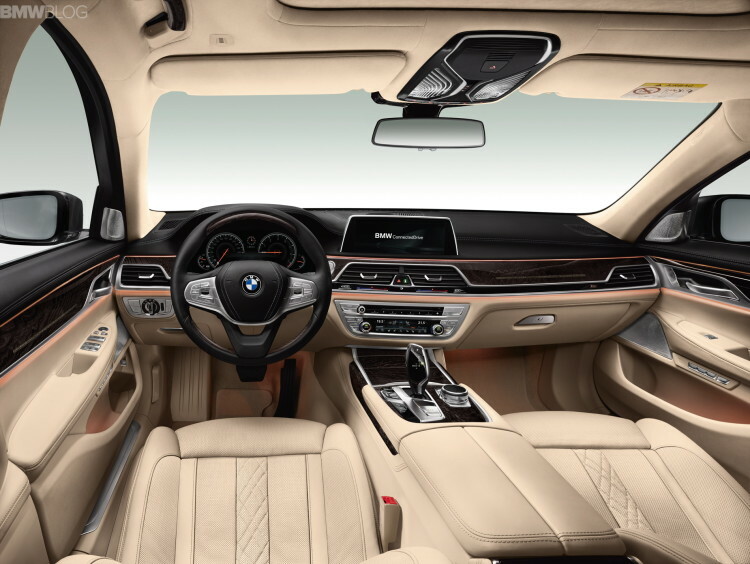 M-specific details also underline the sporting character of the new BMW 7 Series in the interior. These include the BMW Individual headliner in Anthracite and the M driver’s footrest. The complete package for enhancing driving pleasure and efficiency in the new BMW 7 Series comprises intelligent lightweight design with carbon-fiber-reinforced plastic (CFRP) as part of the BMW EfficientLightweight concept, a new TwinPower turbo inline 6-cylinder in the 740i engine from the BMW Group’s new generation of modular engines, in combination with innovative new solutions for honing energy management and aerodynamic properties. The use of BMW eDrive technology in the BMW 740e xDrive plug-in hybrid model constitutes yet another highlight. The new BMW 7 Series obtains an exemplary life-cycle thanks to resource-efficient material selection, new energy-efficient production processes and recycling. In order to achieve this, tangible sustainability targets spanning the vehicle’s entire life cycle were defined in the early strategic phase of development and actively implemented throughout the development process. The standard-equipment eight-speed Sport Automatic Steptronic transmission serves to boost efficiency with its wider ratio spread, reduced weight and optimized efficiency. A new transmission control system makes for more comfortable shifting and allows the transmission to be linked up with the standard Navigation system. The navigation-data- based shift strategy means that the gear selection can be adapted to the driving situation and the route profile even if route guidance has not been set. The shift characteristics are adjusted in accordance with the selected driving mode, so that the emphasis can be placed on both driving comfort and sportiness. The transmission also includes paddle shifters on the steering wheel and a Launch Control function that allows acceleration runs from standstill with maximum power and optimum traction. Features such as Brake Energy Regeneration and the Auto Start Stop function ensure highly efficient energy management. Activating the ECO PRO mode with the Driving Dynamics Control switch allows use of the coasting function which decouples the powertrain in coasting phases while travelling at speeds between (31 – 100 mph). This mode’s range of functions which are now individually programmable for the first time additionally include efficiency oriented operation of comfort functions, efficiency tips, as well as the Route-ahead Assistant, which gives recommendations for an efficient driving style based on the navigation data. The innovative lightweight design concept behind the new BMW 7 Series’ body structure with Carbon Core makes significant advances not just in terms of weight optimization but also in enhancing the strength and stiffness of the passenger compartment structure. The integral safety concept comprises not only highly resilient supporting architecture but also generous deformation zones and precisely defined load paths that ensure forces generated in an impact are diverted and absorbed ensuring occupant safety. Reliable protection in all conceivable impact situations is also guaranteed by comprehensive safety equipment featuring front and side airbags, head/curtain airbags for the front and rear seats, active head restraints, three-point inertia-reel seat belts with belt force limiters and belt tensioners in the front seats, as well as ISOFIX child seat mountings in the rear. If a collision threatens, the standard Active Protection system activates the belt tensioners and, if necessary, closes the side windows and the moonroof. The seat backrests are also brought into an upright position to ensure the restraint systems work optimally. 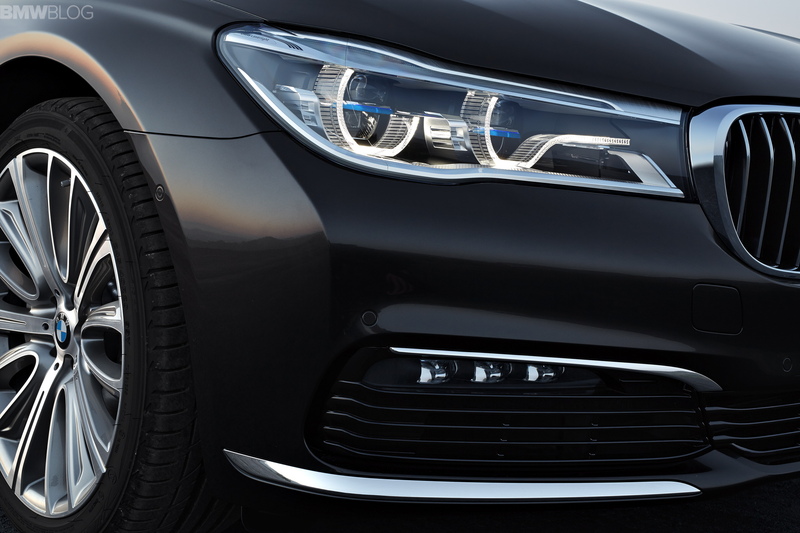 The technology, design and equipment of the sixth generation 7 Series illustrate examples of the leadership role played by the flagship model in the global automotive marketplace. The BMW Individual program created for the latest edition of the luxury sedan provides the opportunity to combine technological highlights with the vehicle design that is precision- tailored to his or her personal style. Interior and exterior features meet the highest quality standards attainable in car manufacturing in terms of design, material selection and quality of workmanship. Exterior colors, exclusive light-alloy wheels, wood and leather variants can be customized to customer’s preference. Additional customer requests can be made through BMW Individual. For the first time, BMW Individual fine-grain Merino full leather in Tartufo is being offered. The leather upholstery is carefully selected from unblemished raw materials which are processed using particularly gentle techniques that assure the softest texture. As a result, the leather used for the seats, door trim panels, lower instrument panel section, center console, armrests and door pulls retains its natural open-pore structure. The soft, fine-grain surfaces remain breathable and provide supreme comfort. Hand-woven piping and woven- look quilting on the seat surfaces lend expression to the precision workmanship and love of detail that defines the production process. To match this, the floor covering and floor mats, seat belts and BMW Individual Alcantara headliner also come in Tartufo. The harmonious and stylish ambience is capped by door sills with illuminated BMW Individual lettering, BMW Individual interior trim strips in Piano Finish Black and a BMW Individual leather steering wheel with fine-wood applications in the same finish.Designworks, BMW’s California based design studio and consultancy offers a BMW Individual Consultation program where clients work directly with a Designworks designer to commission their very own BMW. Lead designer, Sandy McGill and the design team consult in-house or via the phone, to provide the best possible experience for BMW customers. During the consultation sessions, clients are provided with image concepts as well as color, leather and trim samples they can touch and feel. Designworks represents the perfect platform for creating a customized BMW Individual vehicle as it provides access to professional designers that work hand-in-hand with clients throughout the commissioning processes. Plant Dingolfing has accumulated experience of innovative production methods for weight- optimized vehicle components. As part of the BMW’s EfficientLightweight program the new BMWs lightweight Carbon Core-based body of the all-new BMW 7 Series benefits from the knowledge and process available. During production a unique hybrid construction method is being applied that combines carbon-fiber-reinforced plastic (CFRP) with aluminum as well as ultra-high-strength steels for structural elements in the passenger cell. The latest generation of the luxury sedans also benefit from the direct application of highly advanced drive technology. The high-voltage battery for the BMW 740e xDrive plug-in hybrid model will likewise come from Dingolfing.